Using a Bone Growth Stimulator to try and speed the healing process for my femur. This unit is actually one that Olivia purchased when she had bi-lateral tibial stress fractures a couple of years ago. The battery died as I was using it for my last stress fracture, and the manufacturer will only replace the battery if there is a current prescription for the original patient that received the device (i.e. Olivia). Even then it would cost $100. Buying a new unit is $300+ unless you can somehow get insurance to cover it. The battery is not supposed to be user replaceable, but I found a place in Minnesota that carries the proprietary model for $35. I cracked open the case, plugged the new battery into the circuit board, and voila…good as new. Love it when things work out that way. 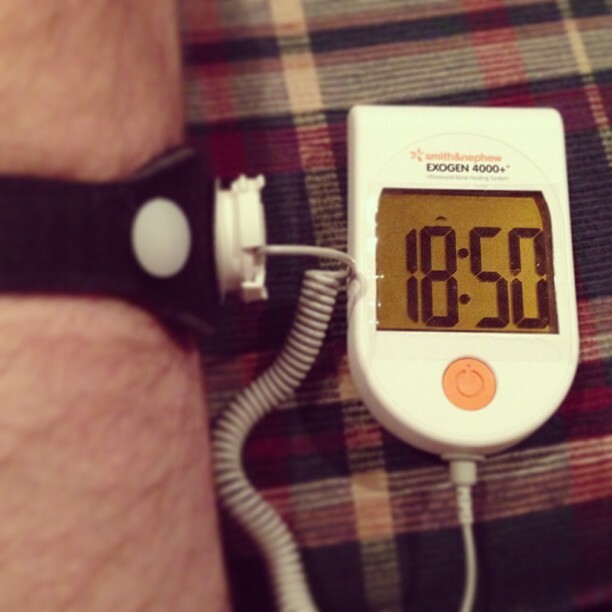 Home » Blog » Instagram » Using a Bone Growth Stimulator to try and speed the healing process for my femur. This unit is actually one that Olivia purchased when she had bi-lateral tibial stress fractures a couple of years ago. The battery died as I was using it for my last stress fracture, and the manufacturer will only replace the battery if there is a current prescription for the original patient that received the device (i.e. Olivia). Even then it would cost $100. Buying a new unit is $300+ unless you can somehow get insurance to cover it. The battery is not supposed to be user replaceable, but I found a place in Minnesota that carries the proprietary model for $35. I cracked open the case, plugged the new battery into the circuit board, and voila…good as new. Love it when things work out that way.